2018 was a year of change and growth. The market shifted from an extreme seller’s market, but still had strong gains. Year-over-year, median price is up 9% and since 2012 has increased 85%! Over the last 19 years, the average year-over-year price increase has been 6%. This puts into perspective the growth we have experienced, resulting in well-established equity levels. In 2018, inventory averaged 1.5 months, double that of 2017. This caused the month-over-month price gains to slow, and we experienced a price correction over the second half of the year. 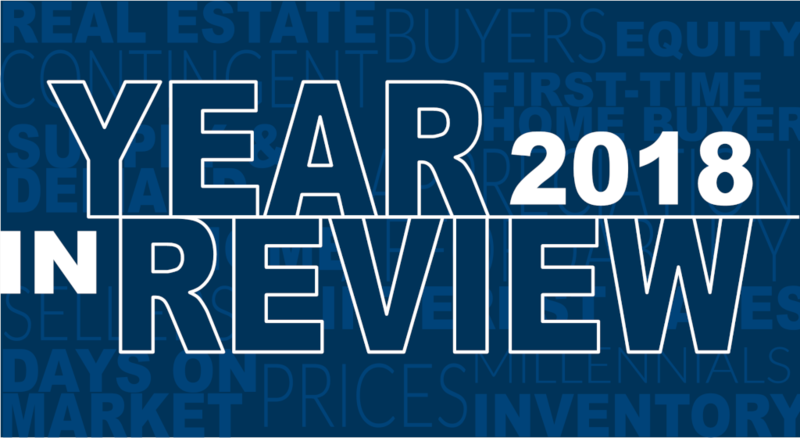 We expect to see more average levels of price appreciation in 2019 as the market continues to balance out. 2018 was a year of change and growth. The market shifted from an extreme seller’s market, but still had strong gains. Year-over-year, median price is up 9% and since 2012 has increased 88%! Over the last 19 years, the average year-over-year price increase has been 6%. This puts into perspective the growth we have experienced, resulting in well-established equity levels. In 2018, inventory averaged 1.6 months, higher than 2017. This caused the month-over-month price gains to slow, and we experienced a price correction over the second half of the year. We expect to see more average levels of price appreciation in 2019 as the market continues to balance out. 2018 was a year of growth and change. The dynamic greater Seattle area and hottest real estate market in the country started to head toward some balance. After six years of expansion resulting in an extreme seller’s market, we encountered a market shift in the late spring. Where it is tricky, is the media paints a somewhat scary picture, cherry picking month-over-month statistics instead of looking at the entire year in review. I thought I’d take the opportunity to recap what led to this shift and where we might be headed. In May, we saw a 40% increase in homes for sale. For so many years, the lack of inventory was the central theme of the market, with inventory levels as low as a two-week supply in the first quarter of 2018. These constricted inventory levels led to huge price escalations from buyers competing in multiple offers. It was not uncommon to have 10 buyers fighting over one house, resulting in a sale price 20% over the list price. That type of price growth is unreasonable and the result of the extreme market conditions. In May, that changed as many sellers started to come to market. Suddenly, buyers had more choices and multiple offers started to wane. This phenomenon led to a decrease in month-over-month price appreciation. It just so happened that the increase in inventory was accompanied by two other influential factors. We had an increase in interest rate, and the now-repealed “Seattle Head Tax” was passed on May 14th, 2018 by the Seattle City Council. Interest rates had been hovering in the low 4%s during all of 2017 and even in the high 3%s in 2016. We started 2018 in the low 4%s, but by May the rate had jumped a half-point. Coupled with extreme price jumps from limited inventory, affordability became an issue for many buyers. This started bringing folks to the sidelines. A large contributor to the growth in our real estate market over the past 6 years was our robust job market, and the employment growth of companies such as Amazon. The “Seattle Head Tax” that passed in mid-May, but then repealed on June 12th, 2018, was a huge threat to our thriving economy. The angst it created in our region about the future of Seattle’s job market was palpable, and had companies like Amazon making bold moves such as halting all current construction projects. Also, we were in the midst of Amazon’s HQ2 search, and the head tax had Seattle on the line in regards to remaining the home to the big employers that have fed our job growth and economic rise. The combination of a 40% increase in new listings, a half-point rise in interest rates, and the month-long battle over the head tax created pause in our real estate market. With more selection, more expensive money, and the drama in the Seattle City Council, folks were unsure of where we were headed. This created confusion, and when people are not clear they are less likely to make decisions. In retrospect, it was the perfect storm. Like any storm, it changed the environment, and like a washed-out road, we had to find a new route. The new route, while a bit bumpy and new to navigate, has been refreshing and necessary. For so many years, we have been begging for more inventory to help temper price growth and create more mobility in the market. From 2016 to 2017, we had 14% year-over-year growth in median price in both King and Snohomish counties. To put that in perspective, the average year-over-year appreciation rate over the last 19 years has been 6%. Home values growing at double-digit appreciation rates was unsustainable, and quite frankly not affordable. This balancing-out of the market is a healthy and more sustainable new route. Year-to-date, Snohomish County’s median price has grown 10% over the previous year and King county, 9%. A large part of that growth happened in the first half of the year, and we have seen some month-over-month prices go down since, as the market starts to find some balance. The media loves to report these month-over-month numbers to create headlines, but buries the big picture of growth over the previous year and the fact that balance is healthy, in the last few paragraphs of any given article. The mobility that this created has been a welcome change. People were not putting their homes up for sale because they feared the prospect of finding their next one, so they stayed put. The almost overnight increase in selection created a more comfortable environment for the seller who also had to buy their next home. We have even started to see home sale contingency offers come together as this market has started to balance out. As we round out 2018, in Snohomish County we ended November with two months of inventory based on pending sales, and 2.4 months in King County. This is still a seller’s market, but not the extreme seller’s market that had only two weeks of inventory – and that is a good thing. A balanced market is when you hit four months of inventory, and we have a way to go to get there. Bear in mind that these measurements are of the entire county and do not take price points into consideration. We have seen inventory pile a little higher in the higher price points. The big news is that sellers are sitting on a ton of equity. In Snohomish County, we have seen a 62% increase in median price since 2012, and in King County, 66%. As long as sellers keep this in perspective and understand that pricing needs to reflect the inventory levels, they will find great success. The opportunity to make a move-up, downsize, or even buy your first home is awesome right now. Selection is actually an option and interest rates are still historically low. Currently, we are hovering around 5%, and they have actually recently dropped. Rates are predicted to head toward the mid 5%s in 2019, making a purchase now very appealing. If you are just curious about the value of your home in today’s market or you are considering a move in 2019, please reach out. I’d be happy to relate the current market conditions to your investment and your goals. Education and awareness led to clarity, and when one is clear, they are empowered to make strong decisions. It is my mission to help educate my clients and assist them in making these big life decisions. Whatever your goals are in 2019, it is my honor to help keep you informed on all things real estate related. There are several compelling reasons to take measures at home to conserve water. 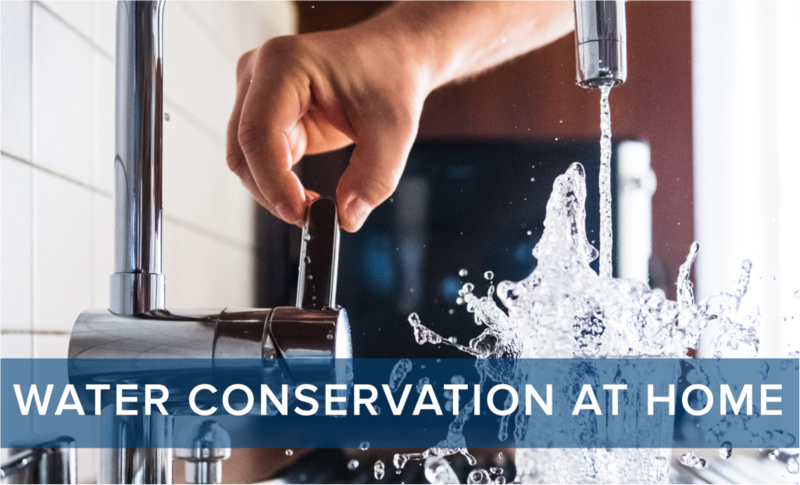 Not only will you save money on your utility bill, but conserving water will also help to protect our environment. Reducing how much water we use (and waste) also reduces the energy required to process and deliver it to our homes and businesses. This helps reduce pollution and conserve fuel. Minimizing water use also helps to extend the life of septic systems, and can help avoid costly sewage system expansions. It’s easy to forget that water is a finite resource, but the stark truth is that only 3% of the water on Earth is fresh water. As populations grow, if we do not protect this precious resource, we may find down the road a lack of adequate, healthy water supply. This would have drastic consequences on water costs, food supplies, and health hazards. The most effective way to save water is to upgrade your appliances and fixtures. But there are many other ways to reduce the amount of water used at home, most of which do not require any significant investment. 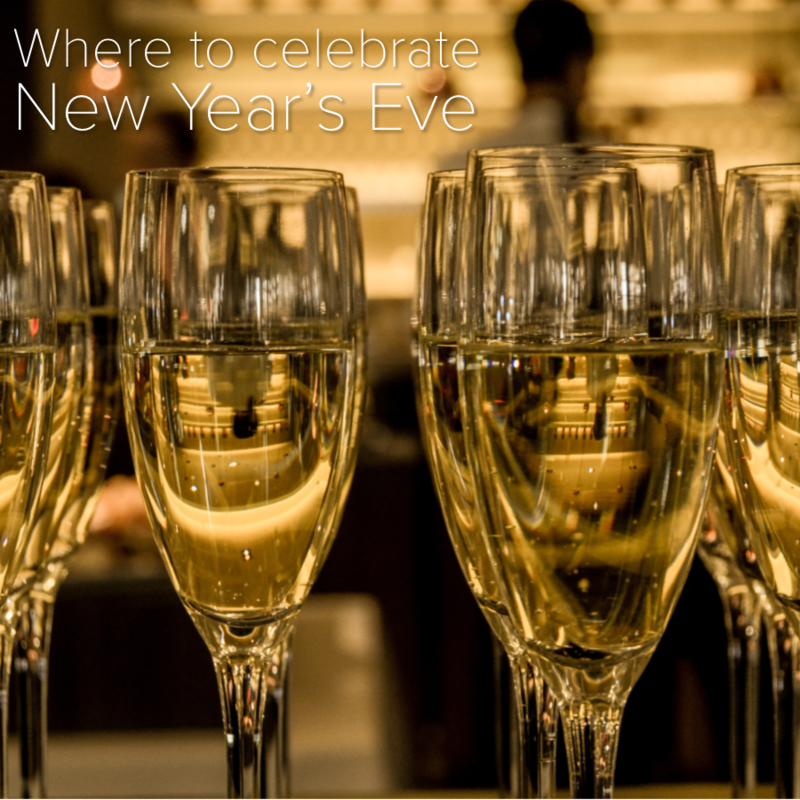 Check out this list to get you started. A quick google search will provide even more ideas. Making just a few small changes over the next year can add up to hundreds or even thousands of gallons in water savings! We are so fortunate here at Windermere to have Matthew Gardner, Windermere’s Chief Economist to help keep us informed on our economy and the real estate market. Each quarter Matthew compiles in-depth research on counties from across Western Washington. Click here to download Matthew’s full Q3 2018 report and check out the latest on the area you call home. At the close of the third quarter, the Windermere Foundation had donated (year-to-date) over $1.2 million to non-profit organizations in communities throughout the Western U.S. that provide services to low-income and homeless families. 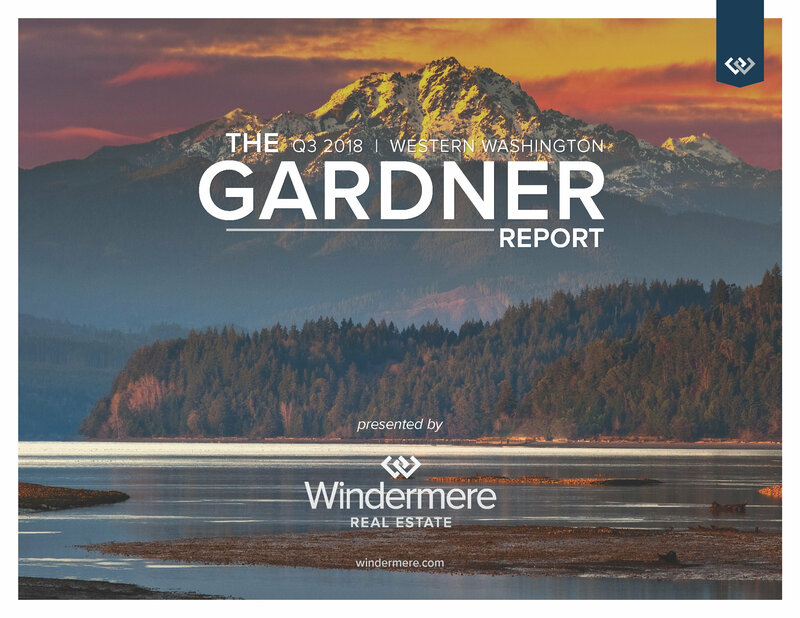 During the third quarter alone, the Windermere Foundation collected over $742,226 in donations; 70 percent of which came from individual contributions and fundraisers, while 30 percent came from donations through Windermere agent sales transactions. This brings the grand total to $37,151,731 raised since 1989! If you would like to learn more about how the Windermere Foundation is supporting low-income and homeless families in our communities, check out this blog post. And for information on how we’re helping the California Wildfire Relief Fund, click here. Thank you for your support! Together, we are able to make a real difference for those in need in our local communities. Click here to learn more about the Windermere Foundation. Consider this house protected. 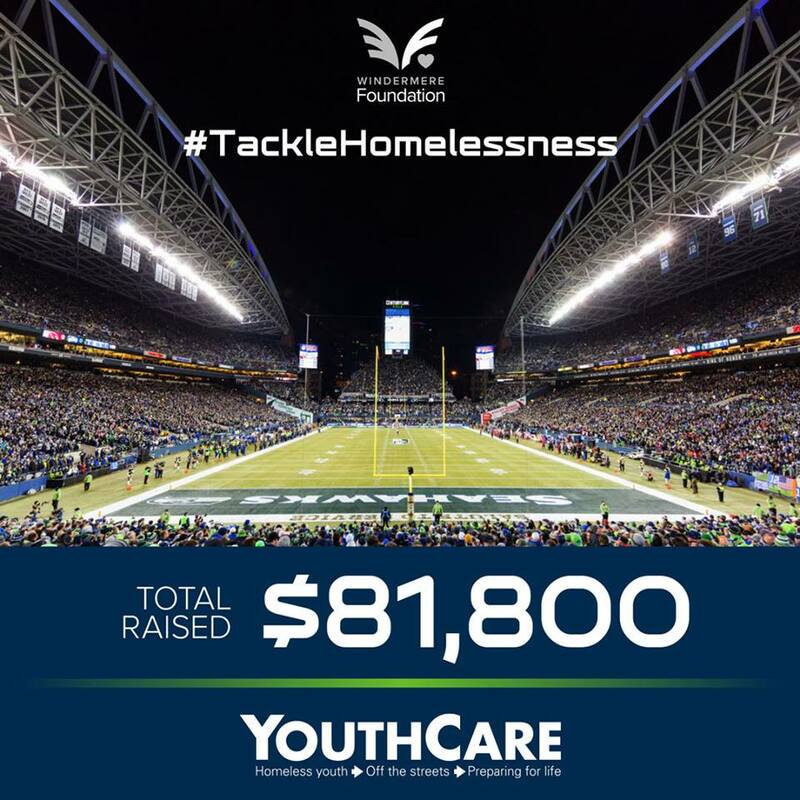 In our last home game win against the Packers, the Seattle Seahawks also brought home $2,800 to be donated to YouthCare to #TackleHomelessness. With that, we’re up to $15,000 raised this season and $81,800 in total! Great work and #GoHawks! Sign up for a monthly overview of what’s happening in the zip code(s) of your choice. Neighborhood News is a great tool to stay informed about the home values and activity in your own backyard or to study a new market you may be interested in. Click here to sign up on my website.